When my husband and I finally took possession of our new home we discovered a gem: finished hardwood floors underneath nasty carpet in our entire upstairs. We knew we wanted to tear out the carpet as soon as possible, and after hours of stripping wallpaper, priming and painting, we were ready. 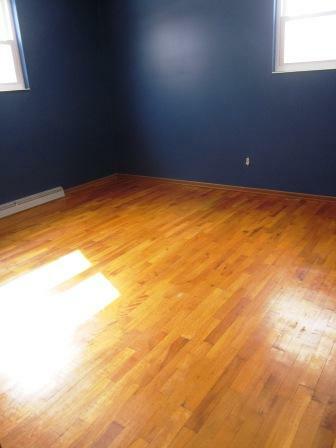 The results were great in our daughter’s bedroom, and not so shabby in the hall and the master bedroom. Then we discovered the floor in our son’s bedroom. 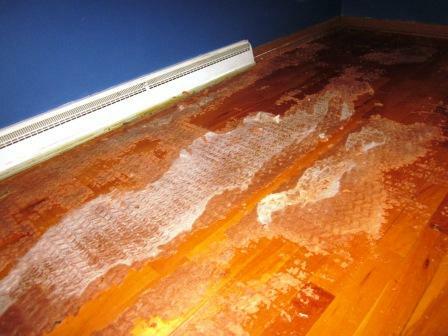 The hardwood looked fine, but a different kind of rubbery carpet padding had been used in the room. And instead of coming right up, most of the padding was cemented to the floor. At first, I tried to pick off the padding that could come off easily. Once I finished that stage, I tried spraying a mixture of one part vinegar to one part hot water. It did absolutely nothing. Then I tried scraping off any matted padding with a plastic joint compound spreader. For hours. All of the rough, repetitive motion left the muscles, joints, and bones in my fingers, hand, wrist, arm, and back in pain. What was left was the truly stuck-on padding. It looked a lot like someone had spread on gallons of refried beans and baked them onto the floor. Unfortunately, there was almost no way to scrape this remainder off the floor. I was starting to contemplate carpeting the room, so I searched online for padding removal ideas. Fortunately I found one message board from other homeowners who dealt with the same hideous kind of carpet padding that stuck on hardwood floors. It was after I read their solutions that I decided to try very un-green, very unhealthy solutions. (Forgive me, readers.) And they worked. My husband wanted me to try Goof-Off, a can full of toxins (like xylene) that gave me a headache as soon as I opened it. It worked, but it also removed the stain – which I didn’t want. I couldn’t stand the fumes, so stopped using it. Next I tried a combination of one part hot water and one part ammonia. Ick. (Yes, I know ammonia irritates eyes, noses, and throats, and can even cause burns and respiratory problems if the exposure is too great. After I developed pneumonia a month after this home improvement project, I wonder if the room and sickness have any connection.) I used a breathing mask and rubber gloves and wiped it on the stubborn areas. After letting it set for ten minutes, I scrubbed it off with a scrubber sponge, chiseled it off with the joint compound spreader, and wiped it off with a rag. Then I repeated, and repeated, and repeated. It still was a very long process, but it was effective. Once my hand and arm pain was pretty unbearable and the toughest spots were left, I simply tried melting the padding off the floor with a blow dryer on high. It was the greenest solution at this stage, and it worked like a charm. I was able to scrape the cemented parts off like Silly Putty, then I wiped the residue off with the ammonia and water mixture. In the end, it took twenty-six hours of labor to clean the padding off the entire floor. It was brutal. But I finished the floor. 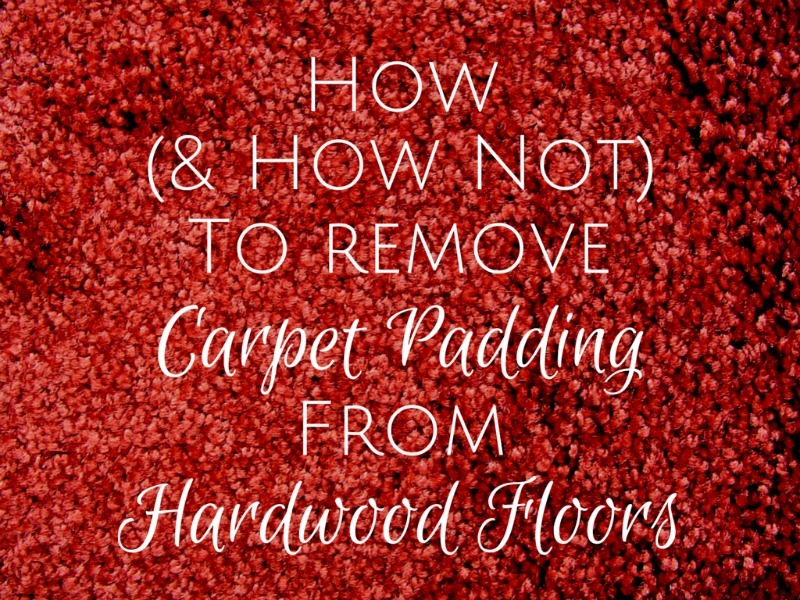 Have you had similar trouble trying to remove carpet padding? What techniques did you use? I have ths same problem but with 825 sq ft of hardwood floor to clean. The padding is more than 50 years old and it is stuck stuck to the floor. I have tried hot water and stiff scrapers and had mild success with lots and lots of hard scraping but I don’t think that I can do 4 full size rooms with this technique. Any easier solutions out there? I rented a wallpaper steamer to remove the tar paper from my 1950’s hardwood floors. It was a huge success!! After scraping my wood stairs with a putty knife for hours, I got the stuck carpet pad off, but was left with a red sticky residue! I didn’t want to use chemicals to remove it, so I tried a Mr. Clean eraser pad dipped into hot water and squeezed out. Bingo! Worked like a charm!!! I can’t wait to try your dryer method. I too have this pad only mine is red. I have had mild success (if you can call it that) in the non-traffic areas with a putty knife and sometimes hot water as well. I too suffered body aches for days. Now I am to the parts that won’t come off. I am so glad I found your post. I will let you know how mine turned out! I read another post where the person mixed white vinegar and hot water (probably in a spray bottle). Left it on for a few minutes to soak in, then scraped up with a plastic scraper. Makes sense. This method works miracles on wallpaper removal. Wonderful tip! You saved me so much work. Advice: use a heat gun (craft store kind) less noise & weight. Works like a charm. Many thanks! I’m glad I’ve helped save you time and energy! If I ever have to do it again (and hopefully I won’t!) I’ll follow your advice with the heat gun! Using a flood light is a fantastic tip, Jimmy. Thanks for sharing! I saw a tip somewhere to use Resolve, the carpet cleaner, but not to clean the carpet but get the padding residue up from a hardwood floor. The padding was not glued down, but fused with the floor anyway. It takes some elbow grease but it worked. Thanks for this post and to Mark for the suggestion to use Resolve! After hours of scraping, hot blow dryer, vinegar and hot water, I finally searched for this problem and found this post!The Resolve and easily rolling up the old padding residue with a plastic scraper worked like a charm. Saved me hours and hours of labor and frustration. Thanks again! Did you use the foam style Resolve carpet cleaner? We just pulled up carpet from our hallway and found the original hardwood underneath with old pad fused to the wood as well. When we pulled the old carpet and padding (which was a blue/yellow mixed color) from our floors, we found a thin layer of what apparently was black foam from the carpet before! It had fused with the beautiful oak hardwood floors. We scraped by hand, from a standing position, with a long handled scraper. I secured the tube from the shop vac onto the scraper blade for automatic clean-up and dust control. This removed about 50% of the old foam. 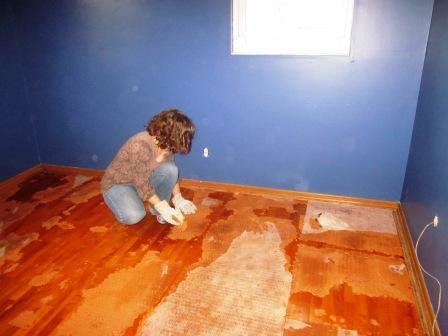 Then I called my local carpet store and asked for a referal for someone experienced in hardwood floor refinishing. The man I called came out and in one day, with the right tools, he sanded two rooms and the hall singlehanded without much dust! His price was reasonable and I couldn’t have done that kind of work myself, even if I rented the tools. It was easy for me to refinish the newly sanded floors with polyurethane. Thanks for this post! We bought our house with hardwood in the bedrooms and were told that the rest of the house that was carpeted had the same hardwood underneath. Imagine our horror when we realized how awful this stuff was to remove! It appears that the rubber padding was placed down in the 70’s/80’s, then when it was replaced, the current carpet pad and carpet were just place right on top of the rubber layer. When talking about how to update this, we decided to leave the bedrooms as-is, try and remove the rubber padding from the dining room only, and just update the carpeting in the rest of the house. We started with putty knives, trying to gently chip the padding off. Multiple hours yielded maybe less than 4 square feet of progress. And all the aches and pains as described by Hilary. We also tried one little patch of Goof Off, but I wasn’t impressed. Then, our carpeting/flooring installer came and took a look and suggested using a household iron with the steam setting, and a damp kitchen towel. It worked like a DREAM! And without any chemicals! We have put in about 10 hours over the last week, and have about 80% 12×12 room done. We’ve got it down to a system. We used pliers, flat head screwdriver, iron with steam function (you may want to get a cheap one from Goodwill, or plan to have to clean it very well after this project), a couple of kitchen towels (the ‘flour sack’ kind WITHOUT looped fibers, we purchased inexpensive ones that you can just throw away afterwards), putty knife, spray bottle with water, and additional water for the iron as you work. 2. Scored the papery/fabric layer in a grid, making “tiles” for easy/less messy removal as you go. 3. Lay the kitchen towel down on the edge, covering a whole “tile” for removal. Spray the towel with water to thoroughly cover the section, and lay the iron down. Give it 15-20 seconds for the steam to work itself through the rubber. 4. Move the towel and the iron and scrape up the softened putty-like rubber! When my husband and I got into the groove of it, he would gently pull the steaming iron along one strip, and I would scrape away, lifting whole tiles up as we went. The flooring/carpet guy said that the rubber removal by itself might’ve been a $600 job, MINIMUM, for a little 12×12 room, maybe more if the material was really that awful to remove. Then add the cost of refinishing. Yes, this is a pretty tedious process, but the money, time, and pain we’ve saved with this iron-process has been worth it. We are now left with some marks that look a bit like red tire tracks all over the floor, but we’ve been told by the flooring/carpet guy that they can sand that right off, as long as the thick stuff is taken off. We’re so excited to finish this project, and see the end result (and add value/future buyer-appeal to our home)! I hope this has helped somebody out there! Thank you! The hair dryer and elbow grease worked. Now I can return the can of denatured alcohol that I almost opened.